I'm a non-expert on sushi, but I eat it so I, therefore, can write about it. I had some this last Lenton Friday. I'll often grab some at Kroger nearby my office and make a lighter lunch out of it. 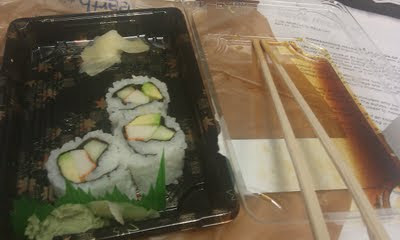 California Roll is about as far as I like to go. I'm sure some people who now consider me more than the novice I disclosed in the column title will stop reading by now. The best advice I got, and I can't credit where I read this, was to dabble some wasabi onto a piece. Then, dip the piece into some soy sauce, but be careful just to dab a little bit. Every few pieces, cleanse the pallet with a bit of some pickled ginger and go again. The advice, as I recall, was that this way preserved the array of flavors best of all with no one dominating. I'll go for that. Enjoy.